Easy to install and maintenance-free, the Perma-Vent Condensation Control Vent is a quick and easy way to reduce, if not stop, condensation in localised areas. 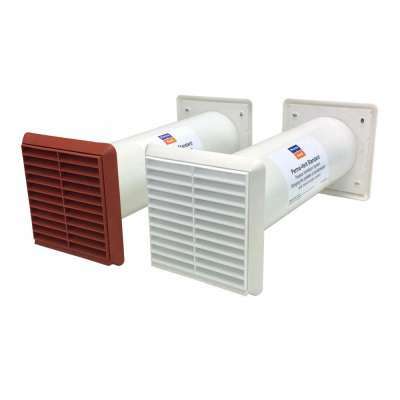 The environmentally friendly Perma-Vent contains no moving parts and requires no maintenance. It works on the scientific principle that when the room temperature and humidity are greater internally than externally, moist air will be ventilated outside the building due to vapour air differences. The Perma-Vent contains a vapour permeable membrane, which allows vapour out of the building without allowing a draught back inside. The unit is easily and economically installed using a 4.25” (107mm) core cutter. It can be positioned wherever condensation and mould are most prevalent. The thickness of the wall does not present a problem as the standard unit is supplied with a 13.5" (350mm) long central core which will be suitable for most properties. The unit is designed to be very unobtrusive, with a 6" (152mm) internal white plastic grill. Externally all that can be seen is a 6" white plastic external grille. It is possible in severe instances that a more advanced condensation control unit will be required to remedy issues with condensation. However, the installation of a Perma-Vent Standard is a simple, inexpensive starting point to tackle the local problems of condensation and mould. The external diameter of the tube is 104mm so the core should be cut larger eg. 4.25” (107mm). If you have any questions about dealing with black mould, problem condensation or any other damp issues then contact our expert team on 0117 982 3282. Brought two of these now, they keep the moisture down & don't make the room cold. Yes you could go out & buy these bits to make one yourself for a bit cheaper, but the waste from the leftover bits wouldn't be worth it if you just wanted one or two. I've fitted 4 of these vents with a noticeable difference straight away, I'm about to order another 4 to fit in several other properties with a condensation problem. Highly effective when used with a fungicidal wash and mould kill paint. delivery very expensive for weight of item. doesn't work on heavy condensation. I installed two of these, one in a bedroom and one in the lounge of my flat. They worked pretty much immediately. Simple product, extremely well priced and it does exactly what it says it will do.....problem solved! Cheap,effective & works really well. This is a very expensive item, which basically consists of a piece of plastic pipe and 2 grills which can both be purchased at a fraction of the cost at any local hardware store. But what about the special membrane you ask. The "membrane" appears to be a rolled up piece of foam, not dissimilar to what you get as packing material in a parcel. So the product weighs next to nothing but what do you get charged for the postage ? Which I will admit was speedy. A whopping TWELVE POUND yes that's right a huge £12. I was recommended to have a Perma-Vent installed in my rear bedroom by Permagard as a first step to stopping my condensation issues. The product was delivered very quickly and my builder had the unit installed the same day. After treating the walls with the mould wash my room appears to be condensation free and no more mould. Thanks to the technical department for you help. Very basic product but works remarkable well, I have situated the vent as recommended near the area of condensation and have had good results in reduction of condensation and no re-growth of black mould ( I cleaned the area with Multicide) Thank you to the lovely lady on the phone for all of her help. After speaking with the technical department purchased the Permavent standard, have installed it and the condensation has nearly disappeared but to be fair Permagard did suggest that I may need two vents so buying another one now. Simple product but excellent results. Mould has noticeably descreased and the flat is much fresher. Reasonable price and good service - product was delivered day after purchase. What size core drill do I need to install a Perma-Vent passive vent? You will require a 107mm core drill, and you should drill at a slight downwards angle towards the external face to stop any water ingress. Can the Perma-Vent be used in a kitchen? Yes, the Perma-Vent can be used in a kitchen for background ventilation. However, where there is prevalent mould or condensation, you should always consider the reason for the moisture (cooking). You should also consider the amount of moisture released per minute which in kitchens is high. In this scenario, it would be beneficial to consider an extractor fan or Heat Recovery Unit as they are designed to handle large volumes of air and moisture in a very short period of time. They will remove damp air before it even gets a chance to condense on the cold surface and stop this air from moving to other parts of the property and causing issues elsewhere.